Since the appointment of of their first locally-based brand manager in September 2015 Zenith’s Australian presence has been gradually gaining a foothold courtesy of events, more points of sale, and an increased availability of more models. Recently, I had the chance to look at two of the latter – the Academy Georges Favre-Jacot with fusée chain (which is in rose gold) and the Academy Georges Favre-Jacot Titanium, both of which we are sharing with you today. Above all, Zenith is most well known for the El Primero movement, but recent years have also seen the appearance of a new movement in the form of the 6150 movement, realised in a very elegant form for their 150th birthday, and perhaps lesser known, a fusée and chain watch or two. Named for Georges Favre-Jacot, who founded Zenith in 1865, it makes sense that the brand chose this type of movement with which to honour his name and to celebrate their sesquicentenary. 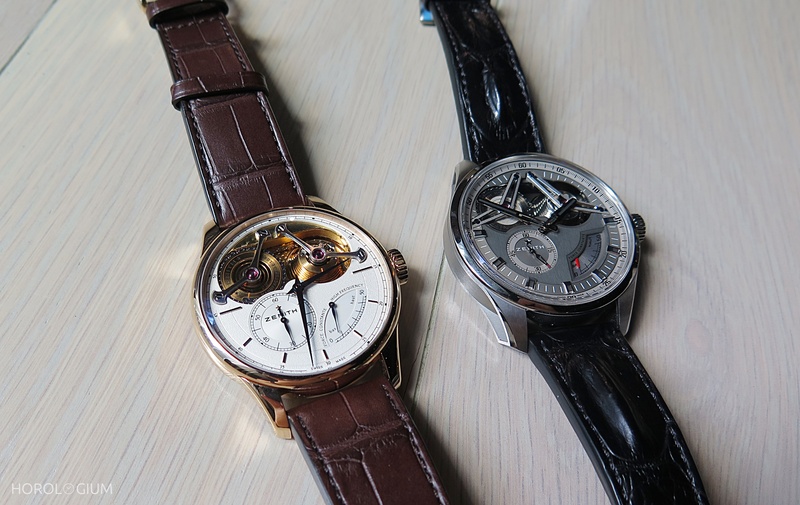 Two models, in rose gold and titanium, were released. “It’s like on a 20 speed bike. As I lose energy in my legs, I change to the bigger ring at the back, hence I can provide constant force to my pedals. the cog at the front is the barrel and the rings at the back wheel the fusée. The fusée (cone) is the back cogs of a bicycle and drives the balance (back wheel). Bicycles are rear wheel drive. The fusée is a mechanism of regulating force to the balance from the spring. The spring drives the watch, and on a bike, my legs are the spring. Traditionally, a mechanical watch receives its energy from a mainspring located in a barrel. The application of tension to a spring unwinds, which provides energy to the gears and to the escapement. The stronger and longer the mainspring, the greater the power reserve, but with length also comes more difficulties with maintaining a constant energy supply; energy is stronger when fully wound and lower when close to the end of the power reserve. The ‘constant force’ which you read about when it comes to watches is about this; the goal is that the energy (force) supplied is constant, the method is that the chain unwraps around a a cone (the fusee) which has a variable circumference that counteracts the effects of the unwinding, making it constant. On these watches it is highlighted in the large aperture between 9 o’clock and 3 o’clock. The 18cm chain has 575 parts (of course all finished with a nice polishing) and the power reserve, fifty hours. It is held in place by polished and chamfered bridges. With the fusée and chain comes the manual-wind El Primero 4810 movement which beats at 36,000VPH, circular graining, and polishing. For the (first) pink gold model, which was the first, the movement is plated in pink gold with a three-quarter plate finished with Geneva stripes and plated in gold. Although the fusée and chain dominates the dial, the rest of it has a grained opaline dial and blued hands along with a small seconds dial between 7 o’clock and 8 o’clock, and a power reserve indicator between 3 o’clock and 6 o’clock. Now to the titanium version, which is less classical and more modern. I had actually expected to prefer the pink gold version but when I actually got to see and handle them both, it wasn’t even close, the titanium was my preference. 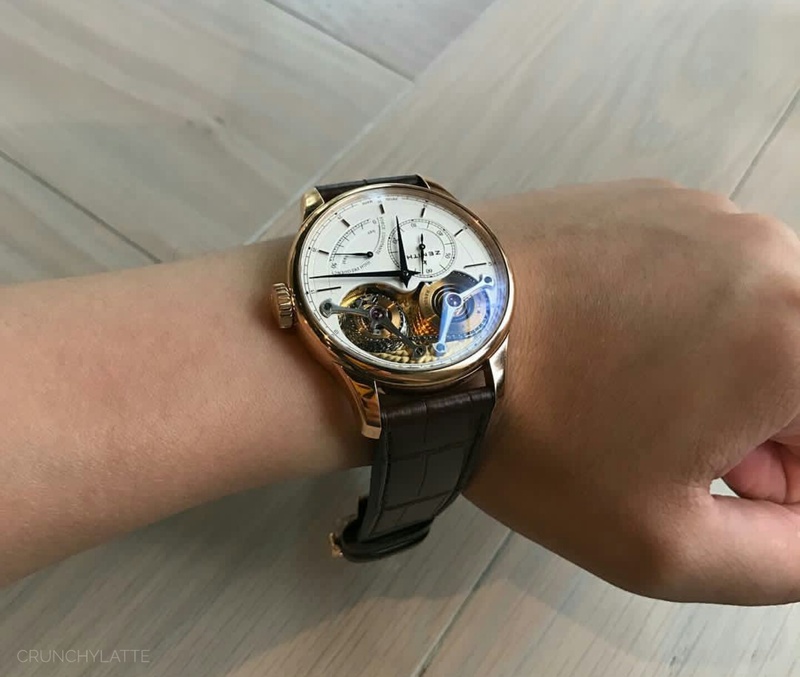 One member of the Horologium team who also saw them both suggested simply flipping the pink gold one upside down so that the fusee and chain are on the bottom and the whole watch is less ‘top heavy’. He’s right, it actually makes a big difference. The titanium model may have the same movement but it’s not just about a new metal. The case is one that used for Zenith’s El Primero collection with more sporty less formal lines. The hollowed-out lugs are of particular note. The metal finishing is both brushed and polished and although it is obviously noticeably lighter than the pink gold version, it also feels like an easier watch to wear on a regular basis not just on weight grounds. Then the dial. The functions and indications may be the same but the differences in execution make it feel like quite a different watch. What are these differences? The hands, the finishing on the dial (now grey and with a brushed finishing), a more angular power reserve aesthetic akin to a gauge. However, the changes aren’t just to the dial but also to the same El Primero Calibre 4810. The main bridge is opened, revealing part of the gear train, but perhaps most unexpectedly, especially for a watch with something as classical as a fusée and chain, the surface of the titanium movement has has been engraved to resemble carbon fibre weave pattern. As a concept it seems a little random, but when seen, it is actually quite interesting. Of the two variants the rose gold one definitely looks the more ‘luxurious’ with its metal and classical approach, but as mentioned earlier, the dominance of the fusée and chain at the top, in rose gold, may make it a bit ‘top heavy’ for some. When I saw both models I was the only one present who preferred the titanium model so perhaps I am an outlier, but the others seemed to agree that even though they were quite taken with the rose gold model, flipping it would make it look even better. Both versions of the Zenith Academy Georges Favre-Jacot with Fusee Chain are limited to 150 pieces. The Australian RRP is $95,000 for the titanium and $103,000 for the rose gold model.